POLL: Should 'Shabby Chic' be recycled or binned? Shabby Chic has been popular since the 1990's, often blending furnishings, accents and finishes which carry the impression of age and use to celebrate the beauty of everyday objects. Do you think Shabby Chic still fashionable or has this trend had it's time? Enlighten us in the comments below! Shabby chic I regard as still very fashionable and people are actively looking for a next project or purchase and I highly admire the talents of designers and artists that execute shabby chic furniture very well and too a high standard. Unfortunately there are a lot of people out there who think they are good at shabby chic and this gives the impression and opinion that shabby chic furniture is short lived and not sustainable. I believe that vintage industrial furniture built from reclaimed cast iron products, steel, zinc and oak are products to last many life times and fit into and compliment many lifestyles and interior designs. I think it depends. There are rooms where shabby chic still works really well, and when that's the case why ignore it as an option. I think that it's a great contrast to the somewhat clinical look which seems to be fashionable right now. Hey, hey, Margo!! Glad to see you're still tooling around the houzz landscape. I don't get notifications for most threads anymore for some random reason, houzz seems to have deleted licksch's thread, and I just don't know what's going on anymore with all the houzz clan. Belated Merry Christmas to you and yours! I love your teal walls and brick ... with regards to colours be aware that they are both warm and muted colours which is why the mustard chairs would look fab as they are in the same colour &quot;family&quot;. For this reason wood items, natural medium-darker richer/warmer wood would look good. Older wood also tends to be richer in colour due to patina. If you really want white (not ideal), use a warm soft white otherwise it will clash and cheapen the look of the room. Same goes for greys, not the ideal choice for this colour family but if you really want them I would go for warm, rich mushroom versions. Greys are fashionable at the moment so there is a tendency to throw them everywhere whereas there are so many other options. I agree with those above that say stick with natural logs, freestanding bookcases better and you can put the TV in one and books above and below. The chair from 'Made' is gorgeous and not a patch on the more clinical Ikea one (I like other Ikea things just not this one) so if you can, I would wait and save up or find something else. I came across my vintage lime and raspberry chair on ebay and fell in love with it and although not dirt cheap (but still good value) it makes me smile everyday so worth every penny (makes my pink/magenta sofa zing). A deep or rusty orange would also look amazing in your room. Here's a random selection of good value examples ... I don't like the legs in these (3) for your room so would get some brown leather ribbon to make them a bit more earthy and wrap around the legs. Would look great and even cheaper than the Ikea ones! http://www.ebay.co.uk/itm/bucket-chairs-in-orange-hessian-x3-/400964597979?hash=item5d5b5a38db or something a bit more unusual/retro ... http://www.ebay.co.uk/itm/1960s-retro-original-chair-covered-in-orange-fabric-design-council-London-/301697474595?hash=item463e922023 More traditional/shabby look (although colours a bit pale) ... http://www.ebay.co.uk/itm/DEL-48-PAIR-Vintage-French-Shabby-Chic-LOUIS-CARVER-Hall-Dining-Arm-Chairs-/181811678698?pt=LH_DefaultDomain_3&amp;hash=item2a54d20dea Retro cocktail chair ... http://www.ebay.co.uk/itm/Oyster-Retro-Occasional-Upholstered-Chair-Orange-Lime-Lola-/351151269668?pt=LH_DefaultDomain_3&amp;var=620439252902&amp;hash=item51c23f2724 Interesting but more classic/subdued ... http://www.ebay.co.uk/itm/New-Richmond-mustard-print-club-chair-armchair-accent-chair-home-furniture-sofa-/281730696757?pt=LH_DefaultDomain_3&amp;hash=item4198754635 Modern but interesting ... http://www.ebay.co.uk/itm/Beautiful-Allermuir-Orange-Yellow-Designer-Chair-RP-560-/201395165075?hash=item2ee4165793 Traditional but interesting ... http://www.ebay.co.uk/itm/Pair-Golden-Yellow-Button-Back-Chairs-/181790044031?pt=LH_DefaultDomain_3&amp;hash=item2a5387ef7f I don't know your taste or what the rest of the room looks like but just showing that there are so many options ... especially if you are willing to be patient and curious, you never know where you'll find something. Creativity outweighs budget and gives you a home with more personality. Also if you find the right chair and then go for it with new fabric and a staple gun. Some designs easier to re-cover than others. As for hubby, he'll like it once it's done and if he's indifferent anyway, at least make one of you happy. Everything you talk about is adding a warm 'feminine' touch which makes a home (yes some men have it too before anyone jumps in), we all have something different to bring to a partnership. Enjoy and remember to post 'after' photos. (my chair from ebay below). POLL: Where do you keep your bin? We have a small bin under the sink for non recycling things, black plastic, the pods from my coffee machine, dirty kitchen roll etc., which before 5p a bag started, used to be lined with a shopping bag, now I save the planet by buying a roll of bin bags! We also have a small food compost bin next to it, which I buy special bags for from amazon. Then, in the garage, which is next to the utility room we have the paper, tin, glass, plastic recycling boxes, the big food bin with the strong lid and the larger general waste bin which is collected every fortnight. I hate seeing bins outside houses and think that the new bin system which requires such a collection of bins has meant some terraced houses in our area have gone down in value, the residents are not always tidy and the council should provide better ways of collecting and dealing with rubbish when people find it hard to store it out of sight. Seeing bins around is one of my big pet hates! Perhaps upgraded. I love the idea of throwing in industrial chic for example to bring it up to date. 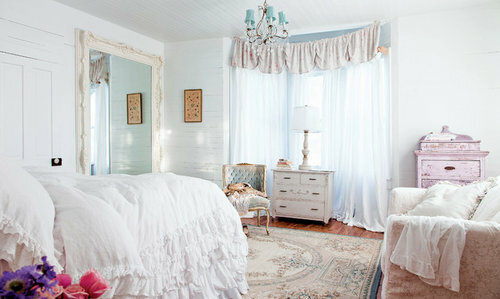 Shabby chic is more of a lifestyle than a design style. People who love it tend to be relaxed & laid back just like the style and it'll be hard to pull them away from it :) The florals are what can make it seem dated and should be used in moderation or replaced with a trendy print like Liberty perhaps? Ban women (usually) who abuse every piece of cheap, inappropriate, furniture with Annie sloan chalk paint then rub it back in obvious places, or worse, disfigure beautiful dark wood furniture with white or cream paint & put a twee tired bit of lace on it & faux french signage. Our 'antique' centres are now full of such atrocities for sale, at fantasy prices, or described on e-bay as 'french'. Mix original distressed old painted furniture into a room & I definitely concur with distilling the sweetness with a bit of industrial. This is what I've done in my own home. I agree with the previous sentiments. Shabby chic shouldn't be 'binned' outright but seen as an option or opportunity. I can't tear myself away from the idea that interiors work best when they are an equal reflection of the owners personality, the property and the heritage of the surrounding environment (there is definitely a Venn diagram in there!). For example I'm not keen on a room of distressed dressers in a 1970s town house. Most trends appear to peak and trough and a good designer puts a twist on it (for example the comments around softening industrial looks) and I for one look forward to its next incarnation. Completely agree with the comment above! Done well, it can be relaxed and stylish, but these days it's just a cop out for those who cannot be arsed. And the abuse of antiques must stop! I personally can't stand shabby chic... I think it looks awful. However that's only my personal opinion. if you love it then it's your home and your choice and shouldn't matter what others think. There is a place for it. I have one bedroom that is, broadly speaking, described as shabby chic but it's because I've inherited my mother's 1950s Olympus bedroom furniture. It's extremely well made and extremely capacious. It's not my style; it was hers; it looks great in the room it is in.